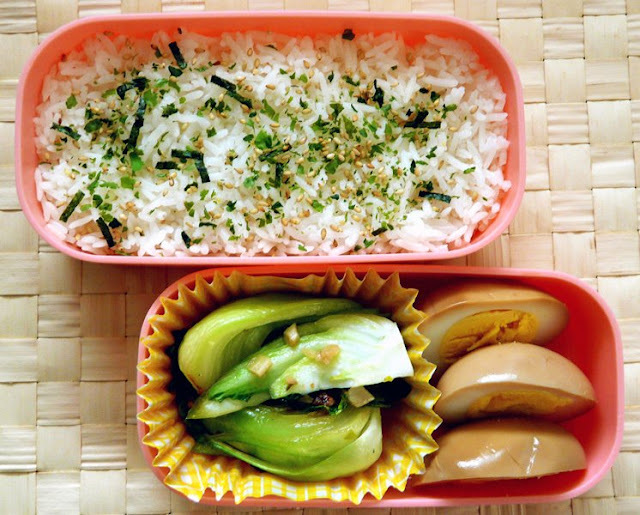 A few years ago, I started packing bentos for my kids to bring to school. I'm not an expert bento maker by any means so they were pretty basic. They didn't have all the fancy little food characters or cute cutout shapes. They did have the occasional piggy egg (a hard boiled egg shaped like a pig), heart shaped rice balls and adorable, colorful toothpicks. Sadly, that was the extent of my bento making skills but it was enough to delight my kids, especially my daughter who was still young enough to appreciate cute little boxes of food. My son was mostly nonplussed about it. As long as the bento box contained food that would satisfy him and fill his belly, he would be a happy camper. No need for cuteness. You know how boys are. Over time, the bento novelty wore off as the kids got older. They started asking for sandwiches instead so I started packing them sandwiches for lunch. My little box of bento supplies soon began collecting dust. But last night, out of the blue, my daughter asked me to make her a bento box for lunch today. She's going on a school field trip to the Natural History Museum and wanted a special lunch to take with her so I happily dug out one of her old bento boxes. 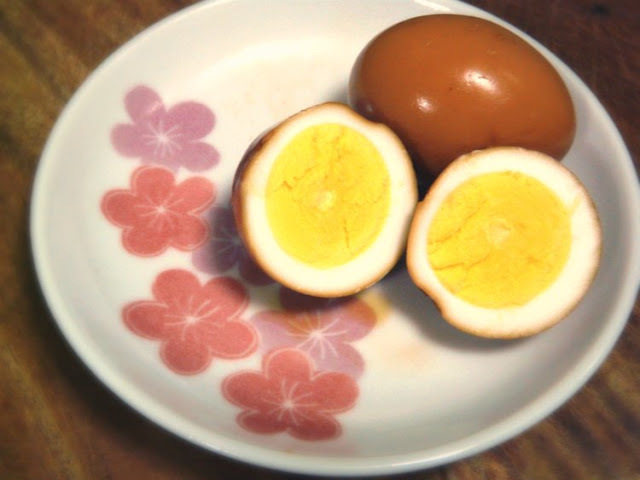 She didn't want anything too cutesy so there's no animal shaped eggs, no kawaii-ish toothpicks or anything. That's ok with me as long as I get to make a bento! 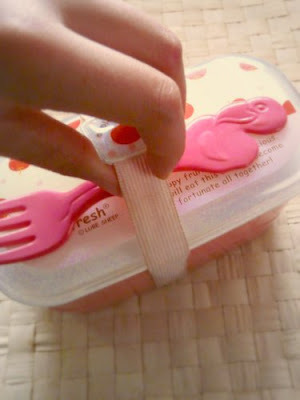 a matching strap and a plastic fork. I decided to pack her some soy sauce eggs because I had recently bought two 18-egg cartons and needed to start using them up. I also included some bok choy which I sauteed very quickly with minced garlic. Add plain Jasmine rice topped with Furikaki to the bento and she's got a lovely lunch to look forward to later. If you want to know more about bento making, visit Cooking Gallery, Just Bento and Lunch in a Box. The two latter sites were the ones that got me interested in bento making and both offer some very helpful bento making tips. Cooking Gallery is a bento focused blog I recently discovered which features gorgeous bentos. Check them out! Place eggs in a pot and fill with cold water, just enough to cover the eggs. Bring the water to a boil then turn off the heat and put a lid on it. Let them sit for 10 to 15 minutes then rinse the eggs in cold tap water until they're cool enough to handle. Peel the eggs carefully, trying not to put any nicks in them. It's not always easy because the egg whites are so delicate but try your best. Heat the soy sauce in a pot and bring to a boil. Add the eggs to the pot then lower the heat so that the soy sauce is simmering a little but no longer boiling vigorously. Roll the eggs around in the pot to coat them, turning them over and over. The soy sauce will slowly thicken. 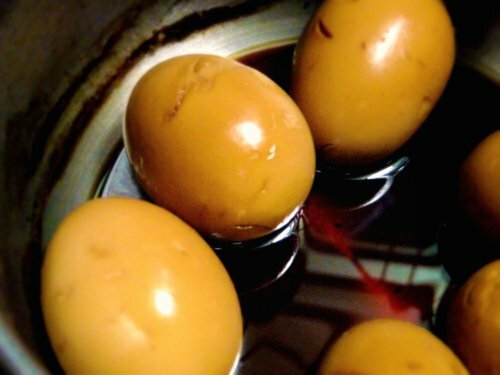 Once the eggs have taken on a nice deep brown color, about 10 minutes, remove them from the pot and transfer to a dish. If you want to be sure you'll get perfectly hard boiled eggs, get an egg timer. I've had mine for almost 10 years and it gives me perfectly boiled eggs every time, regardless of whether it's soft boiled or hard boiled. you'll be using for this dish. 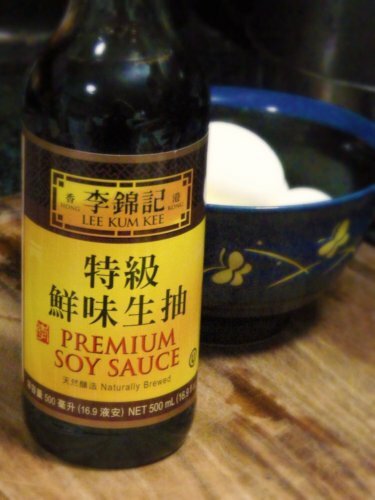 I like Lee Kum Kee's Premium Soy Sauce. Soy sauce eggs, about to be transferred to a dish. 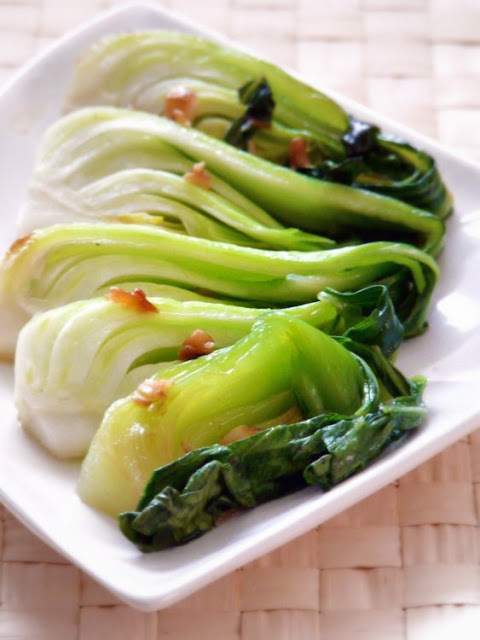 This is my favorite way to cook bok choy and other green leafy Asian vegetables. Their natural flavors really shine when cooked simply, enhanced with a little garlic and a pinch of salt and sugar. Cut the bok choy vertically down the middle. Quarter them if they you have large boy choys with thicker stalks. Place them in a large bowl and fill with cold water. Gently shake them while they're submerged to loosen any dirt caught between their leaves. Drain them well in a colander. Heat oil in a pan over medium high heat then add the minced garlic to it and saute until slightly brown and fragrant. Make sure the garlic does not burn because they will get bitter. I personally like to brown mine just a tad, not to the point of being burnt but just for a little color and texture. Add the bok choy to the pan and stir fry for a few minutes. Add a couple of tablespoons of water along with the salt and sugar then put a lid on the pan and let steam for a minute to soften the stalks. Remove the lid then turn off the heat. Transfer to a serving dish.